Have you ever wanted to be an engineer? 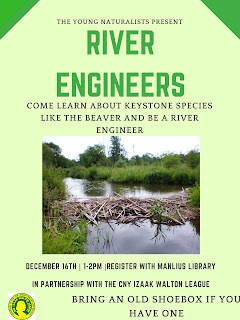 On Saturday December 16th at 1pm in the Manlius Library, the Young Naturalists are doing a program on the beaver, ecosystem engineers. Come learn about how they are a keystone species and what makes them so important to rivers and ponds because of how they change the environment that they live in. Such useful information! Thank you! One of my friend advised using typicalstudent for the same type of content.